Hello and welcome to D's Stamping Team USA March 2016 Blog Hop! This month's theme is Birthdays! If you've already been hopping you should have landed here from Deb Naylor's fabulous blog! If not, make sure you check it out! She is super talented and I know you will not want to miss her inspiration! As you probably know by now, the fabulous Shannon West with Stampin' Up! has started a Birthday craze with her awesome hashtag #Imbringingbirthdaysback! I am totally on board with this endeavor and am working on building up my Birthday Card inventories now so what better theme for a blog hop! I was straightening up my craft area and putting away some cardstock when I noticed how beautiful Calypso Coral looked with Basic Gray. I just knew I wanted to use these together for my card! I started with an 11" x 4 1/4" piece of Basic Gray Cardstock scored at 5 1/2". My next layer was a piece of Calypso Coral DSP Paper Stack. The 3" x 4 1/4" piece of Calypso Coral was stamped tone-on-tone with the floral stamp from Awesomely Artistic prior to mounting on the 3 1/4" x 4 1/2" Basic Gray cardstock layer. The sentiment from Birthday Blooms was stamped in Calypso Coral Ink onto Whisper White and then cut out with the Deco Labels Framelits. 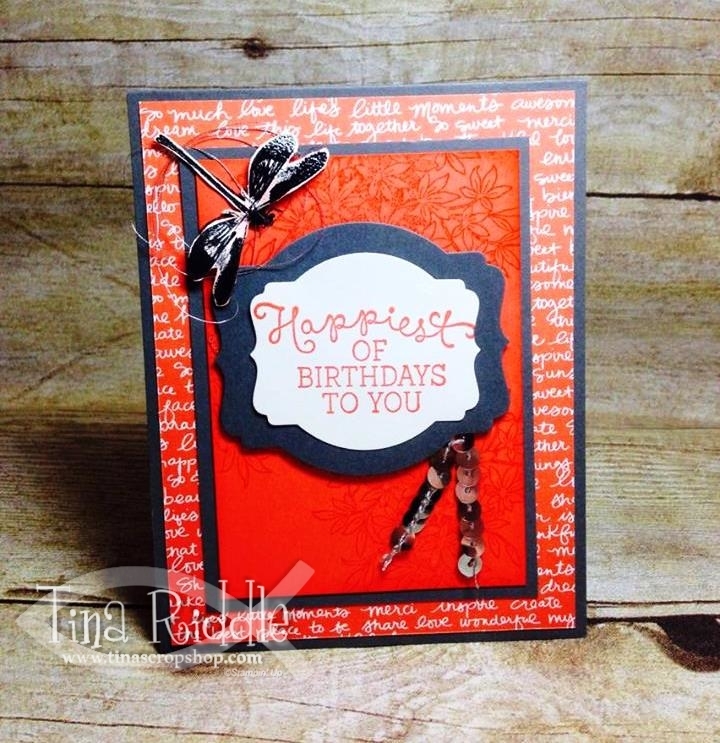 I also cut a larger Basic Gray Deco Label to mat it and then attached the layers with Stampin' Dimensionals. The Dragonfly from Awesomely Artistic was stamped in Memento Tuxedo Black Ink onto the Coral layer and then also stamped and embossed with Black embossing powder on Whisper White cardstock. Since I had already stamped it on the coral, I didn't have to fussy cut the small antennas on the head.. this saved me a lot of time. 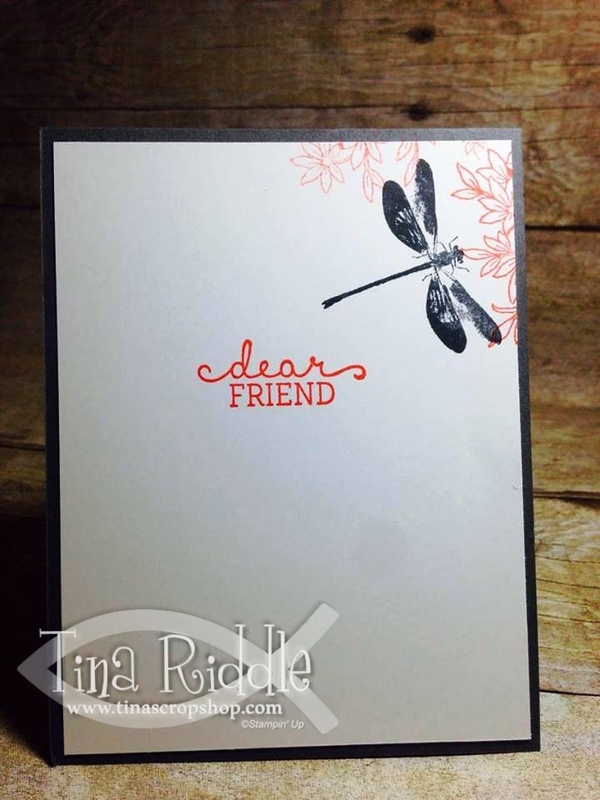 I attached the fussy cut embossed dragonfly onto the stamped one with a glue dot in the middle of the body. I then made some loops of Silver Thread around the dragonfly tucking it under the wings. Once I had the loops the way I wanted them, I adhered the end of the dragonfly's wings with gluedots onto the thread to secure it. Lastly I added a small bent piece of Silver Sequin Trim to the bottom of the Deco Label with two glue dots to secure it well. Here is the inside of my card..
For the inside, I stamped the "dear friend" sentiment from Birthday Blooms in Calypso Coral Ink onto a 4" x 5 1/4" panel of Whisper White Cardstock. I added two stamped off sections of the flowers from Awesomely Artistic also in Calypso Coral on the top and right side and then stamped the dragonfly in Memento Tuxedo Black ink. I hope you enjoyed my card and are ready to head over to my sweet friend, Megan Thompson's blog! Just click the next button and you'll be there! Cute card Tina, love the colors! Your card is beautiful, Tina! SIP Challenge #41 - Weddings! OSAT Blog Hop - Spring Has Sprung! ICS Blog Hop - Welcome Spring!